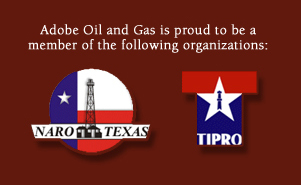 Adobe Oil and Gas, Inc.
How can I divest property with Adobe Oil and Gas? Anyone who has spent time in the Oil and Gas business knows historic highs are often followed by historic lows. Borrowing from the adage “Sell when they are buying, buy when they are selling” - it is realistic to believe there will never be a better time to divest in Oil and Gas properties during this current time period of extreme pricing exuberance. It is our mission that the process of evaluation, valuation and transfer be as smooth and professional as possible for you. First, we review the valuations of your most recent check stubs, proof of payment of ad valorem taxes (if applicable) and your latest division orders. It really is that simple.